During milling, the process forces and poor dynamics of the machine may lead to undesirable vibrations between workpiece and tool. The magnitude of these vibrations and the chatter tendencydepends mainlyuponthe dynamic properties of the Tool-Machine-Workpiece system. The dynamic properties of the workpiece can vary significantly during the cutting process, while removing a large volume from a workpiece. 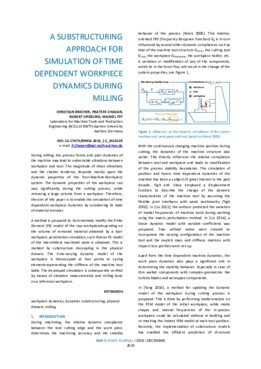 Therefore, the aim of this paper is to enable the simulation of time dependent workpiece dynamics by considering its state of material removal. A method is proposed to incrementally modify the Finite Element (FE) model of the raw workpiecedepending on the volume of removed material obtained by a tool-workpiece penetration simulation, such that an FE model of the intermittent machined state is obtained. This is realized by substructure decoupling in the physical domain. The time-varying dynamic model of the workpiece is thencoupled at four points to spring elementsrepresenting the stiffness of the machine tool table. The developed simulation is subsequently verified by means of vibration measurements and milling tests on a reference workpiece.